This website design project was a fun challenge for us at Studio Pixelated. The business owner, celebrity stylist Jess Zaino, has a lot going on and wanted to consolidate it - fast - under one website for an awards show she was hosting. Jess maintains two different blogs, an ecommerce page at eventbrite.com that handles ticket sales of her Cheap Chic Shopping Tours, and reviews of those tours at Yelp. She wanted to point people to one website, representing one brand, that showed all of these websites under one visual roof and URL. Top nav stays put: When you come to the website from the main domain, www.cheapchicshopping.com, all websites open within the main navigation with the orange bar. 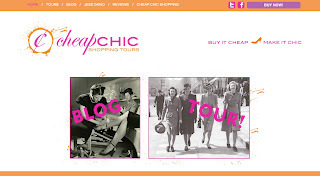 The illusion is that you are reading Jess' blog, or the Cheap Chic Website blog, or are booking a ticket - all from within the Cheap Chic Shopping website. But really, those websites are displaying from within a frame at the main website. Google Analytics keeps tracking: Google Analytics had been in place on the two blogs, and will remain tracking hits, even when those hits are coming from within this new shell of a website.